Corporate exposure to “forest risk commodities” like soy and timber is murky and opaque, but new research shows it could top $900 billion per year. Now, as institutional investors push companies in all sectors to come clean on their climate-change liabilities and exposure, their impacts on forests could become clearer as well. 14 December 2016 | Anne Simpson isn’t impressed with the climate-science deniers that US President-elect Donald Trump is nominating for his cabinet. The economics is backed by $20 trillion in assets managed by the investment groups pushing companies to both disclose their exposure to climate risk and tie it to executive compensation. One of those groups is the California Public Employees Retirement System (CalPERS), and Simpson is its Director of Sustainability. 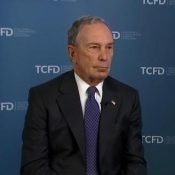 The investors are among 31 members of the Task Force on Climate-Related Financial Disclosures, which is chaired by former New York City Mayor Michael Bloomberg and charged with developing guidelines for disclosing climate-change risk across the Group of 20 industrialized nations. Although voluntary in nature, the guidelines could drive tens of trillions of dollars in investment, forcing companies to reduce their climate impacts even if the Trump administration proves as impotent on the matter as many fear it will be. The Task Forced released its suggested guidelines today in London, and is opening them to feedback for 60 days. The guidance comes just a week after CDP (formerly the Carbon Disclosure Project) said that disruptions to supplies of palm, soy, cattle, and timber & pulp – the “big four” forest risk commodities responsible most of the world’s deforestation – represents a $900 trillion risk to the global economy, per year. The Task Force guidance doesn’t mention deforestation directly, but it calls for full disclosure of supply-change risk, which includes both liability and exposure. It explicitly mentions the need for companies to demonstrate that they have resilient supply chains, and that means disclosing both their impact and reliance on forests, according to Ceres President Mindy Lubber. Lubber said that she was aware of more than a dozen shareholder resolutions asking for more disclosure on deforestation risk. Can Radical Transparency Save Forests?